The world's largest equipment manufacturers call upon Seabee to custom-engineer hydraulic cylinders that meet their unique needs. Our cylinders cover diverse applications in the construction, forestry, agricultural equipment, material handling, marine lifts as well as other manufacturing and mobile industries. Our highly skilled Sales and Application Engineers work closely with your Product Engineers to design cylinders specifically for your applications. Our products are designed for optimum performance in your application as well as manufactured to meet your exact specifications. Seabee can also provide you with accumulators designed for optimum performance. 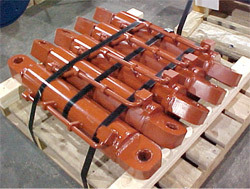 We have designed a piston-type accumulator with buttress threads that reduce tube flare stress. Safety vents in gas and liquid ends warn of internal pressurization. Dished aluminum piston for quick release. AQ seal assembly provides low pressure sealing because the dynamic elastomer maintains a sealed footprint and assures separation. Dual out-board wear strips prevent piston rub and provide large balanced bearing areas. Oil or water service available. -40 F to 250 F operating temperature range. If your needs cannot be met with our standard accumulator, we can manufacture your design or design a custom accumulator for your application.